Small Dog Syndrome: Are we really the cause? You’ve probably heard about Small Dog Syndrome, especially if you have a small dog. Nowadays EVERYTHING has to have a name, but defining this so called disease is not so easy. May I also suggest that this definition may have been written by a person who prefers BIG dogs? There is much circulating on this so called syndrome on the internet with little appearing in scholarly literature. The good news is it’s a highly treatable "disease." It can be treated entirely with home remedies. 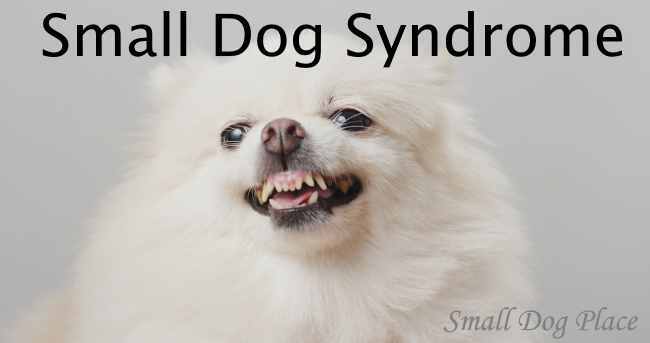 As the term syndrome implies, small dogs who may be “suffering” from this malaise exhibit one or more of the following symptoms. Demanding to get attention, affection, petting, treats, etc. 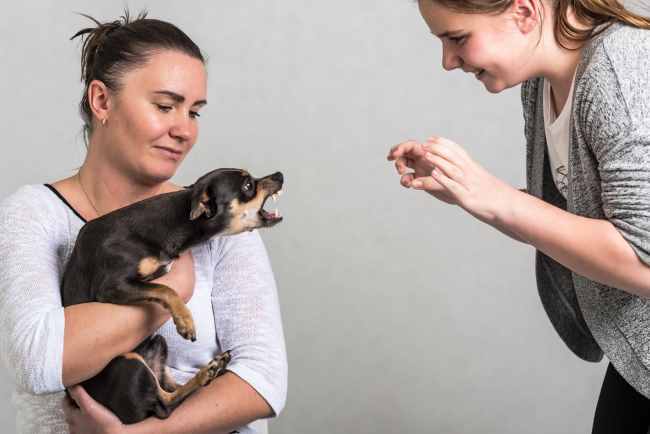 This is basically a list of behaviors that we would prefer not to exist in any dog but can occur as a result of incomplete or inadequate training, socialization and discipline. Small dogs tend to show some or all of these problems because their owners have chosen to allow them to do so. Large dogs can also be guilty of these behaviors but as a rule do not show them to the extent of tiny dogs. Growling Rottweilers, biting German Shepherds, jumping Bernese Mountain Dogs or pulling Akitas would not make for good pets. However, some if not all of the behaviors listed above can be tolerated to some extent in a 4 pound dog. Luckily there are a few simply cures, but treatment depends on the owner’s willingness to tackle the problem(s). How does Small Dog Syndrome Start? We all love small dogs for many different reasons and often they are treated as infant substitutes. Think about it. The average human infant is born weighing 7 or 8 pounds, the exact size of many small dogs. ...When they push their head into our hands, we instinctively begin petting them. Now, if we owned a 70 pound German Shepherd Dog, would we do the same? Would we allow this dog to sit on our lap, sleep on our pillow, start growling or nip at other humans, allow them to destroy our home while we’re away, or refuse to come when called? Society would probably not allow this and our beloved GSD would not live to be a ripe old age if he growled, barked, and ran away when we called him. So we train our big dogs. We must also train our small dogs so as to avoid them falling into the small dog syndrome trap. But that is not the complete picture. It becomes a little more complicated than that. We must reframe how we interpret their actions. Take just one example of small dog syndrome: the example of a dog's jumping up on us: In a dog’s mind, jumping is a form of dominance. In the canine world, a male dog will jump on a receptive female during mating, but at any other time, one jumping on another is seen as a form of dominance. A dog who feels more dominant or wants to show more dominance, will put his paws on the back of another dog. Unless the second dog is very submissive, the act of invading the space of the second dog will often result in a fight. Dogs respect another’s space. When a dog jumps on you without your permission, he is showing dominance over you. Now, if that same dog that decides to jump on you also growls or barks at another person, instead of thinking that the dog is protecting us, we need to think that the dog Is declaring that we are his property. It gives the often overused phrase, “I’m owned by a Yorkie,” a whole new meaning. As puppies we want to assure that our dogs are introduced to as many new environments, people, animals and experiences as we can manage. Small dogs are usually easy to socialize. We love taking our small dogs out in public, but what do we do? We carry them, either in our arms or in stylish doggie purses. We even buy strollers so they can have a free ride wherever we go. Dogs being carried do not get the same type of socialization that a dog who must walk on a leash receives. Even our attempts at socialization may unconsciously lead our dog towards Small Dog Syndrome. Socialization also involves exposed the puppy to the sounds and smells of her environment. Doing this in a loving way without overly comforting the dog if she appears stressed can help her learn to manage her emotions and her social interactions. This helps her by assuring that misplaced fears and anxieties do not set in and become part of her overall personality. Here, I must define what I mean by “overly comforting the dog.” Good human mothers will be available to their infants and young toddlers to help them move slowly but confidently into the world. Human mothers act as a home base as the young toddler ventures out, comforting as needed and reassuring, encouraging, and acting like a nurturing cheerleader as the toddler encounters the world. Canine mothers want their pups to venture out too, but are much less likely to coddle them and shower them with sympathy if they do not at first succeed. We, as pet parents need to take some lessons from canine mothers and encourage, but not shelter them from experiences that the pup might find stressful. A good example of this is when the puppy cries during a thunderstorm and the human mother picks up the puppy, cuddles and assures him everything will be OK.
We want to protect the pup, but at the same time we want to assure that we do not add extra stress. By overly cuddling him during a thunderstorm actually does the reserve of what we want to achieve. It causes the puppy to think that thunderstorms are an actually reason to be scared and needy. Basic commands should be taught early and reinforced daily to even the smallest of puppies. Since tiny puppies usually do not cause the same mayhem of a large rambunctious giant breed puppy, we are inclined to overlook some bad behaviors. Our oversight if done regularly results in an adolescent or adult small breed dog that is poorly behaved. Training to walk on a leash: Requires that the puppy fit comfortably in a harness. Collars can be dangerous to small puppies. Make sure you purchase your XXXXXXXS size harness, go very easy and take as much time as you can to help your puppy learn to walk on a leash. Sometimes it just easier to wait until the puppy grows into the smallest size available on the market which is usually a XXS. Sit, Stay: Very important commands, but if the puppy is small enough, the human can simply pick the puppy up; after all, what’s picking up a 2 pound puppy verses a 42 pound puppy? I could go on and on with excuses as to why small breed dog owners do not train their babies, but I think you get my point. The truth of the matter is that training IS important but training a 2 pound puppy is different than training a 42-pound puppy and in my next article I will go into more details as how training is accomplished with really small dogs. We all know that puppies need discipline. The classic definition of discipline is training or how to encourage a specific behavior and should not be confused with punishment. No one disputes the need for training. We want to train our puppies to eliminate themselves in appropriate places, come when they are called, act appropriately around other dogs, and friendly around people. As good small dog owners, we must find time to train, socialize and discipline our tiny dogs. In the next article, we will discuss how to train our small dogs with simple, basic commands that all dogs need. For information on how to socialize your small breed puppy, check out our article on Puppy Socialization.